* CCTV relay lens for attaching the Noctron to any "C" mount CCD camera. U.S. Generation III night vision technology is the most advanced state-of-the-art technology in the world. It provides the highest low light sensitivity and image resolution with typical image gain of 90,000. Gen III image intensifiers life is almost four times (approximately 7500 hours) that of Gen II systems. The next level of performance are Generation II High Performance (HP) systems. They offer increased photocathode sensitivity with typical image gain of 55,000 versus 30,000 for standard Gen II systems. Signal-to-noise ratios for Gen III systems are approximately eight times better than those of standard Gen II systems resulting in a cleaner image (reduced "snow" in the picture) at very low light levels such as starlight. 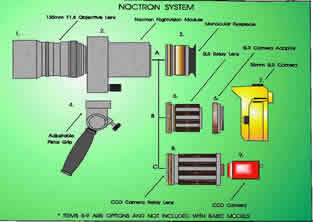 The Noctron is available with all of these technologies.